About Ewen Fields Ewen Fields is made up of 5 stands: the Main Stand, the Scrattin Shed, the Tinker’s Passage end, the Leigh Street stand and the Walker Lane end. All of the stands are covered. 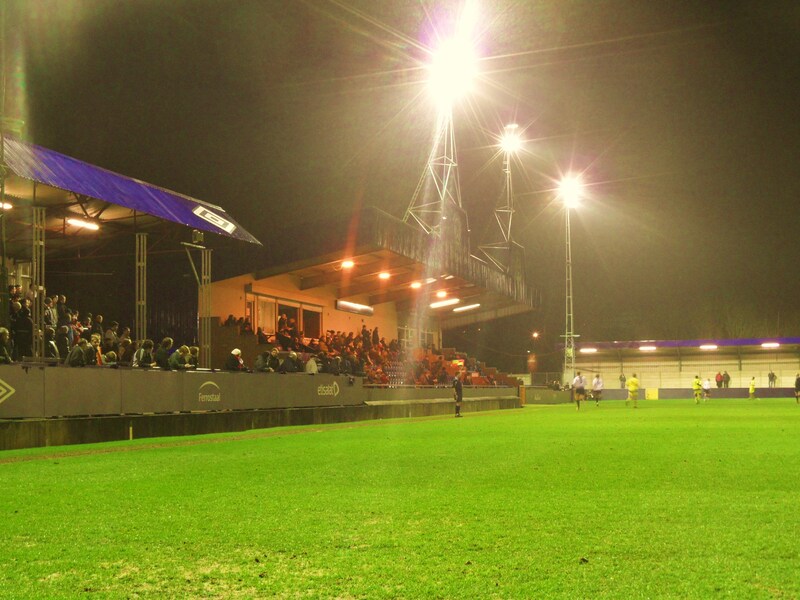 The Main Stand is the only seated stand at Ewen Fields. It also houses the players’ dressing rooms, board room and sponsors lounge as well as a refreshments bar and toilets. Next to the Main Stand is the Scrattin’ Shed, although it is more commonly known as the ‘Shed End’, despite not actually being at the end of the ground. This is where the most vociferous home fans usually congregate. The Social Club is behind the Shed, and traverses the boundary wall. There is a door inside the ground, and one in the car park. The Tinker’s Passage end (named after the footpath which runs behind the stand) is situated behind the goal nearest to the Scrattin’ Shed. Unusually, the stand runs at an acute angle to the goal line. This is because the pitch prior to the Astroturf was not a perfect rectangle, and the stand, which used to be parallel to the goal line, shows the extent of this previous irregularity. 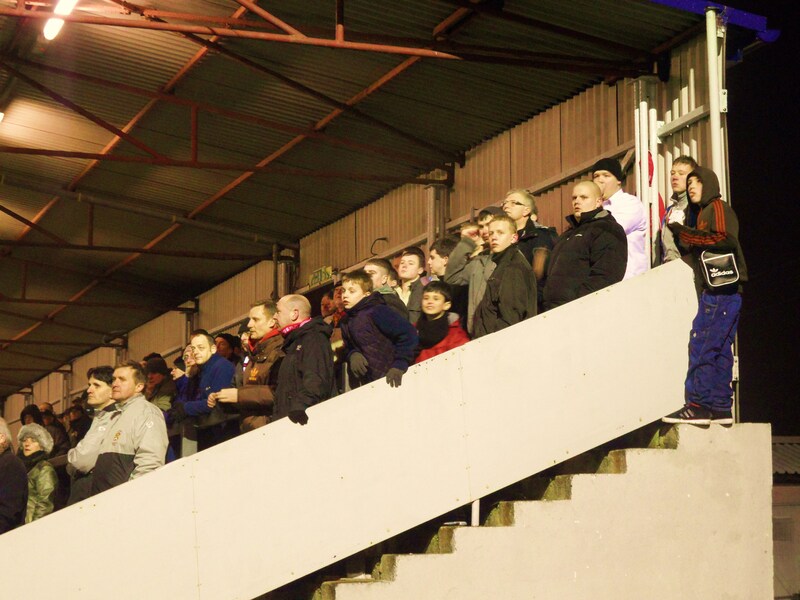 Away fans are housed in the Tinker’s Passage end on the rare occasions that games at Ewen Fields are segregated. Running opposite to the Main Stand and Scrattin’ Shed is the Leigh Street stand, behind the home and away dugouts where another set of vocal home fans stand. A second refreshments bar is also situated on this side. The Walker Lane end (sometimes referred to as the ‘Baths End’ due to the leisure centre situated behind the stand) is situated behind the goal at the opposite end to the Tinker’s Passage end. When the Astroturf was laid, and the pitch realigned, it was also lengthened at this end. As a result, the Walker Lane stand was built afterwards, and is parallel to the goal line. In 2010 Hyde United changed their name to Hyde F.C. and had a kit change back to the original colours which were black and white. 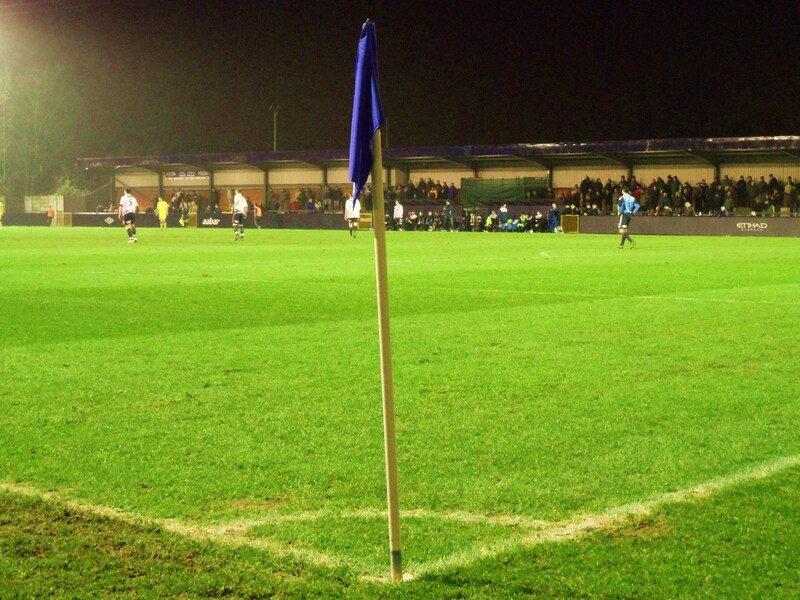 This meant that Ewen Fields would have a make over in summer 2010, which would be funded by Manchester City as part of the clubs partnership, which is in contract from 2010 until 2013. How to get to Ewen Fields If you are travelling on the M60 to junction 24, take the M67 (towards Sheffield) to junction 3 (Hyde Dukinfield Stalybridge.) Once on exit slipway keep to right-hand lane heading for Hyde centre. At traffic lights at end of slipway turn right onto Clarkway. Once on Clarkway/Reynard Street at the second set of lights turn left (MORRISONS superstore will be on your left) onto Mottram Road. At the first set of lights on Mottram Road turn right onto Lumn Road. After approximately 200 yards you will come to a ‘giveway’ sign. There you turn left onto Walker Lane where after approximately 50 yards you will see Hyde Leisure Pool on your left. The entrance to Ewen Fields is to the right hand side of the leisure pool. There is a car park at the ground (entrance on Walker Lane) but this can fill up quickly. Alternative parking is available at the Baths or on streets nearby, however some streets apply restrictions on matchdays and we ask you to please respect these as local residents need access at all times. There is further parking in Hyde Town Centre which is less than half a mile from Ewen Fields. Newton (For Hyde) is the closest station to the ground. Trains depart Manchester Piccadilly every 30 minutes (destination Hadfield). On arrival at Newton (For Hyde) station you need to cross under the tracks and walk down Castle Street to the main road (Commercial Brow/Halton Street). Turn left and walk over the motorway bridge (you will be able to see the floodlights ahead of you) and down the hill until you get to the traffic lights. Turn left onto Mottram Road and then first right onto Grange Road North, first right again leads you into Miles Street and the entrance to the football ground is at the end of the street. Approx 10 minute walk from the station. Admission to Ewen Fields Entrance to the ground is via the turnstiles in the main car park, prices are as follows. Adult: £10.00, Children & OAP’s: £4.00, Children under 16 accompanied by an adult are admitted free. Transfer to the seating area is charged at £2.00 all classes. Our last visit – February 2011 After the high’s of Gainsborough a day’s R and R was in order, which was spent hunting down a pub with an internet connection in LN6. Fortunately ASDA came to the rescue and I spent an hour or so there, reconnecting with society. Fully recharged I headed across the A57 on the notorious Snake Pass ready for another slice of Blue Square Bet North life. I was heading west for the Tameside Derby. And as luck would have it a chance to see another one of the relegation candidates at the foot of the Blue Square Bet North. This really is a different country. After I left the M1 I passed exotic places I had only ever seen on the Northern League website. Stockbridge Park Steels, Glossop North End and Retford United were all passed on the way although the weather up on the moors was not really conducive to playing football. With just 10 miles left to go on the SatNav I was driving past fields of snow and minus 2 degrees. But these areas have a strange effect on the climate and as I descended the A628 and into Hyde all was well with the world and “drizzle” had restored normality. I found Hyde’s Ewen Field ground with relative ease, parked up and took a moment to have a wander around the stadium hoping to bump into the club’s President Sir Geoff Hurst, who of course won the World Cup for England in 1966. For all you kids out there who don’t know it was actually West Ham who won the FA Cup in that year and not England. Long story but your Dad will tell you I am sure. Hyde are a very interesting case study of a football club in transition. A few years ago they were struggling to make ends meet, playing as Hyde United in their red and white kit, almost an homage to Manchester United a few miles around the M60. On 24 September 2009, the club was officially wound up at the High Court in London, with debts of around £120,000 to HM Revenue and Customs. Over the next few days major fund-raising efforts by the club officials, supporters and players, which included a bucket collection at a Manchester City Premier League match, sufficient funds were raised for an appeal to be lodged against the High Court decision. The appeal was heard on 30 September 2009, and the original decision was reversed and they were allowed to live to fight another day. Two years later they have dropped the United and changed their kit to the original white and blue. Are you thinking what we are all thinking? Yes, there has been a City hand in this. A few weeks ago when we mused on the demise of Leyton we suggested that local sides such as West Ham United and Leyton Orient had been notable by their absence in helping out their non league neighbour. The same could not be said for Manchester City and Hyde. Go onto Hyde’s official website and the first thing that will strike you apart from the sky blue design is the similarity of the club badges. Look on the left hand side menu and there is a heading for Manchester City. The world’s richest club play their Elite Squad (posh name for reserves) games at Hyde’s Ewen Fields. The clubs are in a “partnership” which has see Hyde’s ground undergo a complete makeover thanks to the help from Man City. The stands all look freshly painted (in dark City blue), the team wear a kit that is almost a spitting image of an old City one, and they are sponsored by CITC – City In The Community. The one stipulation they had was that only adverts related to City could be displayed around the ground – hence the ones for Etihad, Umbro, Etisalat. So why did City chose Hyde, and not more local teams such as Droylsden? Well it appears that Tameside had a need for such work in the local community and a significant part of City’s support comes from this area, a throwback to playing a few miles away at Maine Road. I think it is an excellent idea, and whilst some other clubs look on jealously, what is clear is that this is no “Sugar Daddy” investment scenario. Man City do not pump money into the club. They have helped Hyde build a base to grow on. The club have been in the Conference North for five seasons now, seemingly stalled in their charge up the divisions. They won back to back promotions from the Northern Leagues in 2003 and 2004. It all looked to have come to a sticky end in 2008/09 when Hyde finished the season in 20th place and were due to be relegated, but were spared when Kings Lynn were demoted for failing to ensure that their home ground met Conference North standards. This season they had struggled again so far, falling into the relegation fight with our old friends Gainsborough Trinity and Stafford Rangers. The visitors, Stalybridge Celtic had travelled all of 4.3 miles for this local derby and were in much better shape than the hosts sitting in 13th place. Stalybridge had brought a fair few fans down the road and started making a decent noise from the moment they arrived. Unusually for Non League grounds the home fans took up a spot on the side of the ground and let the away ones have the ends behind the goals. As the teams came out a quick scan of the programme revealed no ex-League stars, although I am sure Villa may have a word or two if it was the real Ashley Young lining up for Hyde. Hyde FC 0 Stalybridge Celtic 2 – Ewan Fields – Monday 21st February 2011 Both sets of fans got into the ritual derby abuse from kick off. a perfectly observed minute’s silence was ended with a blow on the referees whistle and a shout of “Sheepshaggers”, which had the retort of “Does your carer know you’re here”. Original to say the least. The game wasn’t a classic to be brutally honest. It was interesting to compare the standard between this game and Lewes’s most recent ones which according to the pyramid should be about the same. I would say that from what I have seen the Blue Square Bet South is stronger all the way down, perhaps apart from Alfreton Town at the top whose direct style of play has left them in second place in this league, seven points off the top but with a mere eight games in hand. The major incidents in the opening quarter were all tackle related. Stalybridge Celtic’s Tim Ryan being the first player in the book after just a two minutes. They then lost full back and captain Glenn Rule after he failed to recover from a shuddering tackle. One player who didn’t shirk any challenge was Hyde’s Scott McNiven, with his “robust” frame. He was taunted in the first half by the Celtic fans with a repertoire of songs such as “Diet in a minute, he’s gonna diet in the minute”, “Who ate McDonald’s” and “I predict a diet”. The first real chance didn’t materialise until the twentieth minute when Phil Marsh shot just wide for Celtic. Five minutes later he made no mistake though, running onto a ball over the top of the flat back four and slotting the ball through Kyle Clancy’s legs. Danny Hudson then saw his shot well saved at the other end but the half ended with a whimper rather than a bang. One cup of tea and a check on the West Ham score later and we were back off again. Celtic looked more fluid in the second period after manager Jim Harvey brought on Callum Warburton. Stephen Brogan came close to a second when his effort hit the woodwork. It was a surprise that the second goal took so long in coming really, and most of the home fans sensed it would arrive at some point. A ball over the top saw a one on one for Celtic and as the forward rounded the keeper he was brought down. There was a covering defender but referee Ackermann deemed it a professional foul and sent off Clancy much to his disgust. With all of the substitutes all used up the players looked to each other to see who would draw the short straw and go in goal. Step forward McNiven who put on the gloves and had his moment to make his name from the spot kick. Unfortunately the ball moves faster than McNiven could and Brogan made it two nil and ended any fight that Hyde had left in them. Surprisingly Celtic then took their foot off the gas and decided not to test McNiven in goal. The last action of the game was a second red card for Hyde as Manship was given his marching orders in injury time for a foul. For me it was time to head back over the Pennines. My journey time was extended as I ended up following a police vehicle for a while. Nothing wrong with that you may think, but this was aPolice tractor. I kid you not! Of course I could have taken a picture of this but that would have been illegal, and as you know, I do not do illegal. So day four and three games down. One day left and a trip southish to Grantham, birthplace of the most famous women in the world. More pictures from the game can be found at our Flickr feed here.